Thioredoxin Reductase Assay Kit (ab83463) is a specific assay for detecting Thioredoxin Reductase (TrxR) activity. 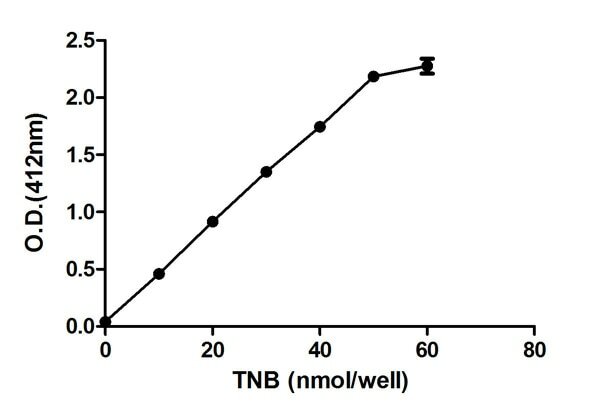 In the thioredoxin reductase assay protocol, TrxR catalyzes the reduction of DTNB to TNB2- in the presence of NADPH, which generates a strong yellow color (ODmax = 412 nm). Other enzymes present in crude biological samples such as glutathione reductase and glutathione peroxidase can also reduce DTNB. In order to measure TrxR-only activity, a TrxR specific inhibitor is used in a separate reaction to determine TrxR specific activity. The difference between total DTNB reduction in the sample and DTNM reduction in the sample in presence of TrxR inhibitor is the value of specific TrxR activity in the sample. Thioredoxin reductase (TrxR, EC 1.8.1.9) is a ubiquitous mammalian enzyme that catalyzes the NADPH-dependent reduction of the redox protein thioredoxin, as well as of other endogenous and exogenous compounds such as selenite, lipid hydroperoxides and hydrogen peroxide. Thioredoxin reductase (TrxR) (EC 1.8.1.9) is a ubiquitous enzyme which is involved in many cellular processes such as cell growth, p53 activity, and protection against oxidation stress, etc. The mammalian TrxR reduces thioredoxins as well as non-disulfide substrates such as selenite, lipoic acids, lipid hydroperoxides, and hydrogen peroxide. TXNRD1: Cytoplasmic. TXNRD2: Cytoplasmic. Nuclear. Microsome. Endoplasmic reticulum. TXNRD3: Mitochondrial. Functional Studies - beta Thioredoxin reductase Assay Kit (ab83463)Image from Bulman CA et al., PLoS One. 2015;9(2):e0003534. Fig 4(A). ; doi: 10.1371/journal.pntd.0003534. Activity of endogenous Brugia thioredoxin reductase from soluble worm lysates following incubation with 1% DMSO or 0.3 μM, 0.1 μM, or 0.03 μM of auranofin in vitro. Percentages indicate the percent activity of TrxR compared to DMSO controls. 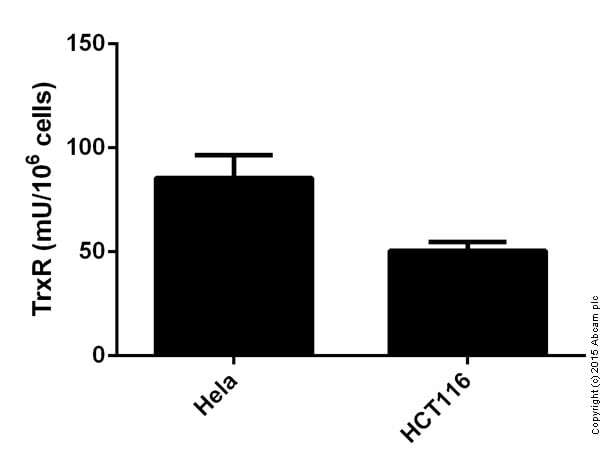 Thioredoxin reductase activity was significantly reduced (p < 0.05) to 15%, 33% and 69% of endogenous activity, respectively, compared to the activity in DMSO-treated worms. Thioredoxin reductase activity of worm lysates was assayed using female B. malayi treated in vitro with either 0.3 μM, 0.1 μM, or 0.03 μM auranofin or 1% DMSO. After 5 hours of treatment, worm motility was measured using the Worminator, and then worms (24 in each group) were pooled, washed three times in PBS, and lysed by douncing in a glass homogenizer in assay buffer (ab83463) with 1 mM PMSF. The crude lysates were centrifuged at 10,000 rcf for 15 minutes at 4°C to pellet insoluble material. The total protein concentrations of soluble lysates were measured using the Bradford assay. The soluble lysates were incubated for 20 minutes in assay buffer or assay buffer with a proprietary thioredoxin reductase specific inhibitor before adding a specific substrate, DTNB (5, 5′-dithiobis (2-nitrobenzoic) acid), and measuring activity at 20 second intervals for 40 minutes using the SpectraMax Plus Microplate Reader (Molecular Devices, Sunnyvale, CA) at λ = 412 nm. Lysates were tested in duplicate. TrxR activity was calculated based on the linear amount of TNB produced per minute per mg of total protein and adjusted for background activity from enzymes other than TrxR in the lysates. Thioredoxin reductase Kinetic Data using ab83463. Publishing research using ab83463? Please let us know so that we can cite the reference in this datasheet. Would it be possible to find out the molar concentration of the TrxR inhibitor that comes with the Thioredoxin Reductase Assay Kit ab83463? I can confirm this product is sourced externally and the molar concentration of the TrxR inhibitor is proprietary information. Regrettably we are not allowed to chare this information on this occasion. I am sorry that I can not be of more help in this case. If you have any further questions, please do not hesitate to ask. proprietary information, which unfortunately I cannot share with you. Can you also confirm that this kit can be used with plasma? Ab83463 can be used to measure TrxR in plasma. It does not need any special preparation. It can be used directly or diluted depending on the TrxR content. Several volumes must be tested in a pilot assay to ensure readings are within the linear standard curve range. Total protein content of plasma can be measured as an internal normalization method. Are there any chelating agents, such as EDTA, in the kit? I wanted to let you know that I have been informed by the lab that there is EDTA in this kit. The standard in this kit is from rat. I can confirm, that regrettably we can not provide any data using serum samples with this kit. However, every sample type and application stated for a product on our datasheets is covered by our six month guarantee. If you experience any problems we would be pleased to offer technical support. In case the ab83463 is not working as stated on our datasheet we will be pleased to offer a free of charge replacement or a credit note as compensation. I apologise for the confusion with our troubleshooting tips. The troubleshooting guide is a general guide provided with all our kits. I can confirm that for the Thioredoxin (TrxR) Reductase Assay Kit (ab83463) it is not recommended to use a >10 kDa Spin column, out of the reasons you already mentioned. Due to your valuable feedback we updated our product booklet and deleted this point in the troubleshooting section. Thank you for your response. I recieved the kit in october and then did not use it for around a month and then used it throughout November (sorry I do not have the exact date of delivery) The order number of the kit is GR56486-1. Sample - The cell lines used in my study were CV1 and MDA-MB-468. To perform the experiment I used 2x105 cells as it is very difficult for me to obtain 2x106 cells. These cells are cultured as adherant cells. The cells were lysed simply using the assay buffer provided in the kit. Protease inhibitor was used. Procedure - Each time the experiment was carried out 20micrograms of protein was used and the volume of each well was adjusted to 50microlitres using assay buffer. The reaction mixture contained 30microlitres of assay buffer, 8microlitres of DTNB and 2microlites of NADPH. The assay buffer was kept on ice at all points during the experiment. The method of measurement was using a a BIO-TEK synergy HT plate reader at 405 nm, every 30 seconds for up to 20 minutes. Here a black sided clear bottomed 96 well plate was used. Here T1 was taken as soon as the reaction mixture was added and T2 was taken at either 20 or 30 minutes (always the last time point). Storage- All the constituents were stored in the freezer while not in use and during the experiment were kept on ice. I have attached a spreadsheet with an example of the standard curve obtained. I have had some feedback from the lab to share with you which may help to improve the results seen so far. The assay buffer needs to be allowed to come to room temperature before use. This may have significantly reduced the reactivity observed with the assay. You are however correct in thinking the NADPH, TrxR inhibitor andTrxR positive control should be kept on ice during the assay. The kit is also not compatible with using fluorometric measurement (I assume this is what you have been doing as you are using black sides/clear bottomed plates). Using this kit you can measure the samples only colorimetrically. The lab has suggestedmeasuring the absorbance at412 nm may be better for your experiment. This should be performed using clear plates. This may significantly change your results. There should be no problem in flash freezing the samples following preparation and storing them at -80°C till needed. I hope these suggestions will help in producing better results than those observed so far. However, if you continue to have problems please do not hesitate to let me know. Could I ask you confirm a few additional details? 1. How was the kit stored for the month in which it was not used? 2. In particular, how was the NADPH kept, both before reconstitution and after? How long in total do you think it was kept on ice when carrying out the assay? 3. Could you also label both what the graph represents and what each of the wells had in it?In particular thestandard used (0, 10, 20, 30, 40 and 50 nmol standard) as well as with the inhibitor added? This will allow me to see if this is the data we would expect to see with the standard experiments. 4. I think I've located your order, was it delivered to the University of Sussex around the 27th of October? Many thanks again for your continued cooperation. Phone call reporting problems in detection of reduction using the Thioredoxin (TrxR) Reductase Assay Kit in frozen samples. 1. Could you please provide me with the order number or the approximate delivery date of the kit. 1.What cells are you using to perform this experiment? 2.How many cells are used for every experiment? 3.Are they cultured as a suspension or as adherent cell culture? 4. How were the cell lysed? Was protease inhibitor used? 1.What volume of sample was added to each well for analysis? 2.How was the reaction mix prepared and how much was added? 3. Was the assay buffer allowed to equilibrate to room temperature before use? 4.Whatmethod was used for measurement?Fluorescent, Luminescence or Colorimeter? And at what wavelength? 5. Which kind of plate was used? 6. Did you perform a reaction kinetics with a sample to find the linear range? At what time points was t1 and t2 taken? 1. How was each of the constituents stored following reconstitution? Could you please share with me the data you have obtained using the kit, specifically the standard curve generated, the kinetic curve generated with your samples, and the readings generated with your samples. This will be very helpful in understanding what you have been observing. Our customer wants to use this ab83463 but he will use insect cell, so could you confirm he can use insect cell sample? Thank you for contacting us. The Thioredoxin (TrxR) Reductase Assay Kit ab83463 contains a TrxR specific inhibitor that is utilized to determine TrxR specific activity. Unfortunately, we have not tested the kit or the inhibitor with insect cells. Theoretically based on the conservation of this enzyme between species, it should also work with insect cells although is is optimised for human samples. Hence in this case the customer will have to determine if this inhibitor would also work for TrxR from insect cells. In case there were any problems using this kit with insect cells, we are happy to offer technical support. I hope this information is helpful to you. Please do not hesitate to contact us if you need any more advice or information. Our customer wants to use this kit using insect cell, so please let me know he can use insect cell or not.